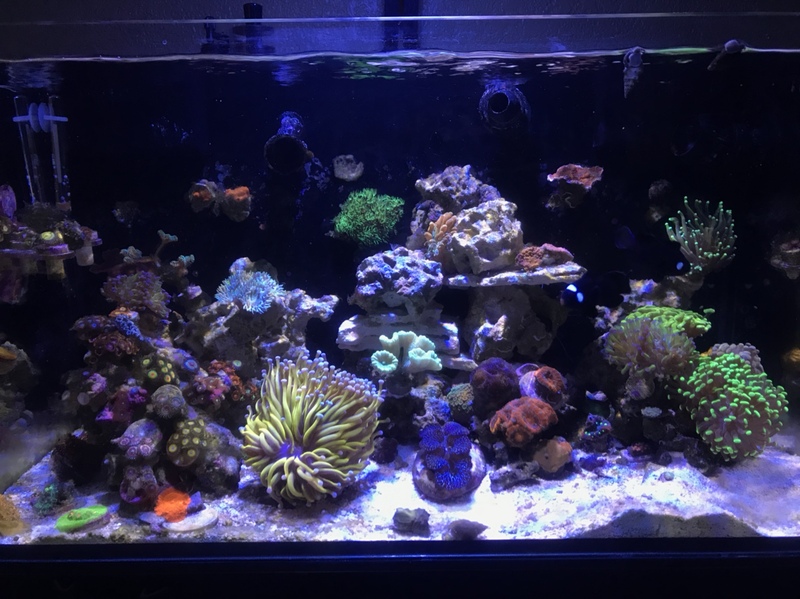 Discussion in 'General Reefkeeping Discussion' started by CJHannibal, Aug 22, 2018. Hey all, I want to put out a feeler of what people think about coral walls like zoas or whatever taking over a back wall in an aio tank, aside from making sure the returns stay clear. This is my vision for my 7 gallon Waterbox I’ll be starting here in a few weeks. Obviously I have a lot of time before I add animals, but I want to have a game plan and see it through before I add my first coral. Thanks all for your input. Thanks Lmmchops, I did just noticed my typo, I wanted to ask if there were any problems or pitfalls people run into with doing this aside from possibly blocking flow? Oh gotcha I havent really heard of any other than putting stuff they regret like gsp or xenia. I've done it with green star polyps. Covered about 2/3 of my 150 tall tank (a 4ft x 30in. wall of aquarium) Added nice movement, easier to care for than scraping algae off the back. GSP can take over a tank and become a nuisance pretty quickly, but since none of my rockwork touched the wall it was more or less isolated. I've seen it done with zoas before, might work better on a smaller scale AIO. Good luck, keep us posted on how it goes! Not intentionally, but the last classroom tank had palys and other polyps growing on it. I agree with Chris, I like the added movement and not having to worry about cleaning it. TheRealChrisBrown and CJHannibal like this. Thanks much. I’ll certainly be posting updates. My back wall is matted with GSP and I love the movement and color I get from it, I hit it with a razor blade when it needs trimmed, super simple. If any of you have some pics I’d love to see em. Thanks for the responses. GSP isn't one of the toxic ones. Its Palys you need to be worried about and to a much lesser extent zoas. Gloves and eyewear are a must when trimming those. Never boil a rock with zoas or Palys, and always wash your hands. I have some green encrusting gorgonians on the back wall in my nuvo 20 which have just started to spread! Not the best picture but here is my back wall. Thanks for sharing your pic, looks great. I’m definitely going to fill up my wall. Thinking all zoas, 3 different colors.